Map the garden site and immediate surrounding areas. - Consider future needs: expansion possibilities; nursery/greenhouse; arbors/trellises; food prep area. *Recommend using a closed system if kitchen scraps will be included; otherwise a three-bin open system if space allows. Also recommend a worm composting system. - Evaluate condition of soil; do soil analysis. 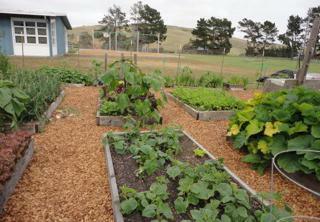 (Based on soil evaluation, decide whether to use raised beds, which are preferred). - If building raised beds, no toxic materials should be used. - Build planting areas OR raised beds and fill with good soil and compost.